Rejuvenated have a fresh approach to beauty and well being. They have been able to bring together exciting, highly effective products that can really make a difference to how you look and feel. It is important to Rejuvenated that they create products that are 100% natural with traceable and ethically sourced ingredients. Be gorgeous naturally with this high strength blend of skin-firming active anti-ageing ingredients in this collagen drink. Ingredients: 10,000 mgs marine collagen (fresh water white fish), hyaluronic acid, acai berry super antioxidant, combined with vitamin B3, B5, C with zinc and copper. Boost levels of peptide rich amino acids and improve the skin’s tone and texture with Collagen Shots active ingredients and reduce the appearance of tell tale signs of ageing. Suitable for diabetics, 100% natural ingredients, gluten free, lactose free. Essential cellular hydration with resveratrol & electrolyte minerals. 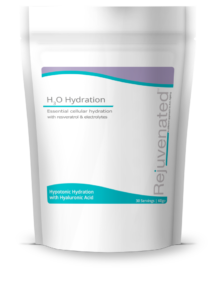 H30 hydration drinks provide provide minerals and ions key in hydration for skin and health. H30 Hydration drinks offer nutritional support for skin throughout the day and contain specific nutrients to enhance water absorption. Your daily serving of H30 Hydration is rich in Calcium, Magnesium and Vitamin C. Hypotonic hydration with hyaluronic acid. 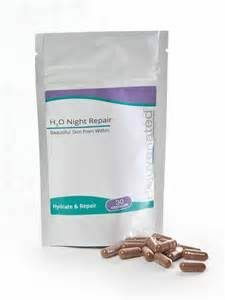 Magnesium contributes to a reduction of tiredness and fatigue. Calcium helps in the process of cell division and specialisation. Vitamin C contributes to the protection of cells from oxidative stress. Suitable for diabetics & vegans, gluten free, lactose free, 100% natural. Wake refreshed and renewed. Just 1 tablet provides minerals and ions key in hydration. A blend of potent herbs and antioxidants while you sleep, offering nutritional support for healthy skin. Your daily serving of H30 Hydration is rich in Calcium, Magnesium and Vitamins A, B, C, D & E. Includes pine bark, grape seed extract, astragalus and astaxanthin. Hypotonic hydration with hyaluronic acid. Astaxanthin is ‘the wonder ingredient from the sea’, possibly the most powerful antioxidant. Suitable for diabetics and vegans, gluten free, lactose free, 100% natural with stevia sweetener. A powerful combination of herbs, vitamins and minerals to assist in healthy weight management. 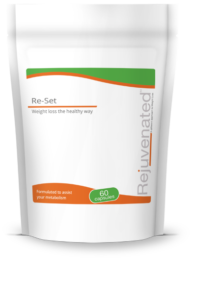 Re-Set is a potent combination of herbs and is rich in active ingredients chromium, copper and zinc, which contribute to healthy metabolism and blood sugar levels. Created to help you achieve your target weight more easily. Compliments any healthy eating regime.